This folding desk is very stable and sturdy, weight is only 17-7/8 LBS, and the volume after folding is less than 2 cubic feet. Open when you used, without assembly. After folding, the thickness is only 4-1/2 inches. 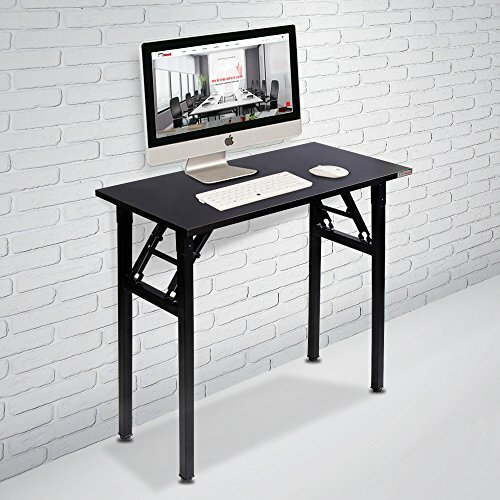 This folding desk can be used for small computer desks, writing desks, study desks, reception tables, and can be combined with other NEED AC5 AC3 products to L shape office desks. Computer desk size: L31 1/2" * W15 3/4" * H29 1/4".It's small and compact design fits where you need it, and still provides enough table space for writing, reading, or working at your computer. It is a perfect addition to home offices, apartments, and college dorm rooms. No need to assemble, can be opened and folded in a few seconds. Adjustable leg pads design, legs can adjust 1/2"-1" length, made the desk keep stable even on uneven floor.It folds up quickly and can be stored easily without taking up too much space.